This small amber glass bottle was recovered from the excavations near Sheffield and has ‘Virol’ embossed across the sidewall. It dates to the late 19th to 20th century. Virol, was produced by Bovril at the turn of the 20th century. Although both contained beef, it was the extra ingredients in Virol that set it apart. According to a 1950's ad*, Virol contained: malt extract, refined beef fat, egg, sugars (including glucose), orange juice, mineral salts and vitamins. It was marketed in at least three ways: as a health supplement (or preventative) for malnourished children, as a nerve tonic called 'Virol and Milk' to combat depression and nervousness, and as a laxative called 'Virolax'. 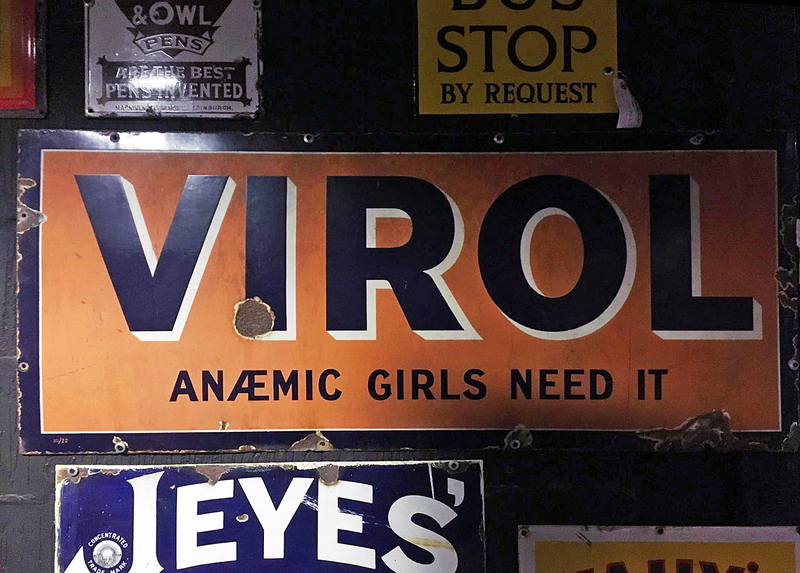 One of our Project Managers remembered this find when they visited Beamish Museum and saw this vintage advertisement for Virol, which claims that 'ANAEMIC GIRLS NEED IT'. It certainly piqued my interest. Why were anaemic children, specifically girls, being targeted by this advertising campaign? The 'ANAEMIC GIRLS NEED IT' ad for Virol was only one of a set of similar signs. Others read 'SCHOOL CHILDREN NEED IT', 'GROWING BOYS NEED IT', 'DELICATE CHILDREN NEED IT' and simply 'FOR HEALTH AND VITALITY'. So, the advertising wasn't specifically aimed at girls, but they all encouraging parents to give their children Virol to ensure they stayed healthy. Commentary on the internet shows that people who were children during WWII have differing memories of Virol: some hated it and others loved the taste. Does anyone remember being given Virol as a child?